Our Deluxe Substitution Trunk is made out of the finest luan and is finished with Formica laminate (customer's choice as to the color or pattern). The trunk is finished with chrome looking trim and steel ball corners and hasps. Our Packing Box style trunk is made of the finest "double A" face birch luan and is finished with clear spray lacquer. 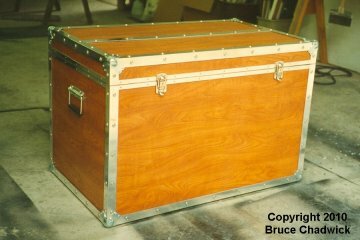 Both trunks are very sturdy and many magicians use our trunks to actually transport other magic props they use in their act. Both props are beautiful in appearance and look like furniture. Trunk version $5000 FOB. Packing Box Style $1800 plus UPS shipping. Handcuffs, bag, and tubular curtain not included. This effect was made famous by Harry Houdini and appropriately named the Metamorphosis (means "change"). The magician displays a beautiful steamer trunk or packing box crate. Volunteers from the audience can assist the magician by moving the trunk in place, opening the hinged lid, and giving the box a thorough inspection. Next the magician displays a pair of handcuffs or other wrist restraint device, and a cloth bag. The magician's assistant enters the trunk and then is handcuffed. Next she enters the bag and one of the volunteers tie the bag closed with a piece of rope. 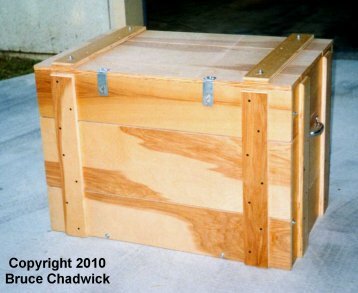 The assistant bends down inside the box, the lid is closed, and the trunk is locked. Lengths of rope can then be used to tie around the box in different directions to further make sure the lid can't easily be opened. Next the magician hops up on top of the trunk and raises a tubular curtain. On the simple count of three, the curtain is dropped and the assistant is now standing on top of the trunk! The trunk is opened and the magician is found in the trunk, and handcuffed inside the cloth bag. 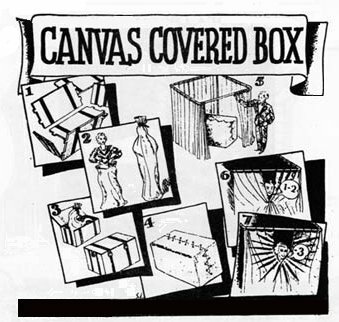 One of the real improvements in the Substitution Trunk effect occurred in the 1940's and 1950's with the addition of a canvas covering that fit around the trunk. The covering was then laced-up in a fashion so that it is impossible for the trunk to be opened in a traditional sense. Known then as well as today as the Canvas Covered Box, the interest in this phenomenal addition has experienced exciting reemergence in recent years. Chadwick Illusion Fabrications makes a canvas covering to fit their Packing Box Style Substitution Trunk. Highly recommended, this addition tends to fool even magicians who are "in the know" regarding traditional sub trunk illusions. $2500 FOB or UPS.